new shirts that will be out this June. Thank you for your time. My name is Andrew and the the story behind my knuckle tattoos, well Love is happiness and Grace…is a lot of things, but for the sake of being combined with love, it’s forgiveness. 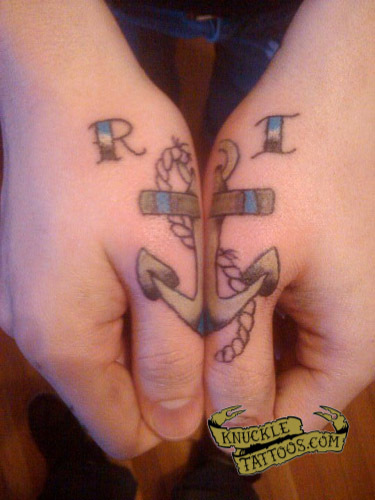 For my thumbs, I’m from Rhode Island, and the anchor is on our flag, “hope we have as an anchor of the soul.” <3 Little Rhodey. I got “TRUE LOVE” a few years back when my daughter started living with me full time,to me the love for your child is true love. The tattoo was done by Gordon Snyder @ S.I.C. Tattoos in Bozeman (now Butte) MT. I got these done a few days ago (8/30/2010). I have numerous tattoos but none have really been as meaningful as these ones. I am jaded and cynical and unwelcoming. It’s all been a process. I am not saying I will never love again, but for now, it doesn’t live in my heart. I want to forget the bad things. Welcome the new. Sullen I know, but it is what it is. My artist really laughed his @ss off when I told him there absolutely NEEDED to be an apostrophe. I think it makes the tattoo. Says he has never done one with punctuation before. Done by Angel Murrietta in Pacific, WA. Pauly here is a door guy at the Nite Hawk Cinema in Brooklyn. He has nothing but love for the world, but he thinks it is high time I got my knuckles done. I kid, but I do have knuckle tattoos, and I thought I’d share mine. The “c’est la vie” statement is something I like to live my life by. Loosely translated from French, it means “such is life” or “that’s life”, which is my rather laid-back way of looking at what comes my way. Bad day, good day, it’s just life and it’s up to me to take it for what it is. I think it’s a very positive way of looking at things, personally. Second, my “Lovesick” tattoo across my lower knuckles was actually the end product of the little heart tattooed on my right middle finger. I got it in honor of my TV show “Rad Girls”, where I serve as the associate producer and occasional on-screen personality. I wanted to incorporate it into something clever, and being the romantic that I am, figured it would be a pretty fitting statement.